Officials of the Economic and Financial Crimes Commission have apprehended Justice Rita Ofili-Ajumogobia, a dismissed judge of the Federal High Court, after corruption charges against her were struck out. Her arrest took place on the premises of an Ikeja High Court, Lagos, on Tuesday. 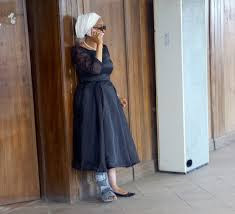 The News Agency of Nigeria reports that about 10 officials of the EFCC surrounded Ofili-Ajumogobia as she attempted to leave the courtroom at 10.24 a.m. after the ruling by Justice Hakeem Oshodi. The EFCC officials however allowed Ofili-Ajumogobia’s co-defendant, Mr. Godwin Obla, SAN, to exit the court premises. NAN reports that earlier, Justice Oshodi, in a ruling, had struck out the 31 counts filed by the EFCC against Ofili-Ajumogobia and Obla on the grounds that the court lacked jurisdiction to hear the suit. Justice Oshodi noted that the anti-graft commission had not followed the procedures set by the National Judicial Council in disciplining erring judicial officers.